DALLAS — “This is the new face of the stranger,” said Jesús Romero, keynote speaker at the June 18 Baptist Peace Fellowship of North America’s Peace Breakfast at the 2015 Cooperative Baptist Fellowship General Assembly. Romero, who is director of the Immigration Service and Aid Center (ISAAC), a project of the Christian Life Commission of the Baptist General Convention, and professor of Spanish at CBF-partner Baptist University of the Americas in San Antonio, Texas, was speaking of immigrants to the United States. Romero spoke about the ISAAC Project’s work providing legal consultation for immigration and shared about his advocacy mission. 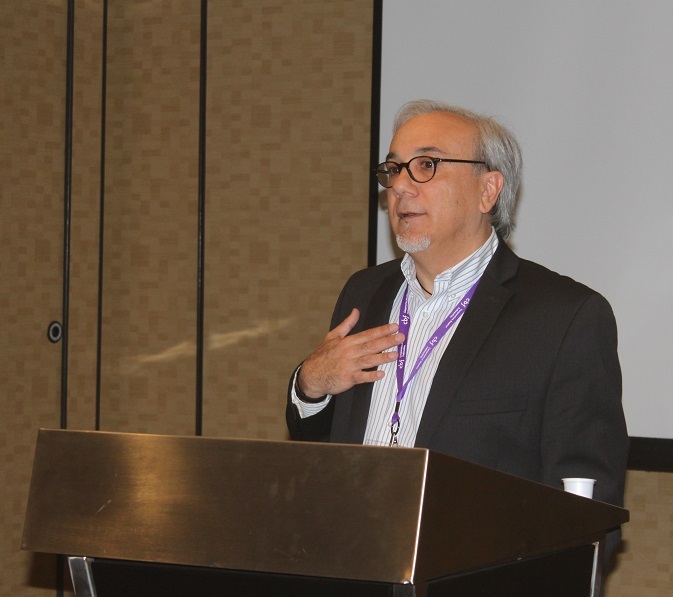 “It has been hard to convince the Body of Christ that immigrants are people we need to be concerned about,” said Romero, suggesting that Christians must work to redeem and rescue the language that has become politicized and polarizing. Highlighting the words “illegal” and “amnesty,” he discussed the ways in which these politically-charged words are used to define people and actions unfairly. Romero directed Christians to love God and others, recognizing that love must translate into actions and advocacy. Other speakers at the breakfast included Gale Paul who spoke about Equal Exchange, and Judith Myers who shared about her experience on a Friendship Tour. Equal Exchange supports fair trade co-ops around the world, helping to connect farmers with customers in ethical ways. BPFNA’s Friendship Tour is an opportunity for people to gather at the border of the United States and Mexico for education, worship and advocacy. “When you support Baptist Peace Fellowship of North America, you make it possible for people to no longer say, ‘I didn’t know,’” BPFNA Executive Director LeDayne McLeese Polaski said. To keep up with news, photos and videos from the 2015 CBF General Assembly in Dallas, Texas, and for information on watching the online livestream of the evening June 17-19 worship and commissioning services of Assembly, please visit www.cbf.net/Dallas2015.